Jersey Shore Boca alum Chris Konopka, who recently completed his four-year NCAA career at Providence College, arrived Sunday in South Wales of the UK for a week-long trial with Cardiff City FC of the English Championship League. The former Boca standout seen here during training with the Red Bulls of MLS this past summer, has drawn interest from several European clubs. TOMS RIVER, NJ (December 17, 2006) – Highly-touted goalkeeper and Jersey Shore Boca alum Chris Konopka, who completed his stellar four-year college career between the pipes at Providence College last month, arrived Sunday in South Wales in the United Kingdom for a week-long trial with Cardiff City FC of the English Championship League. Cardiff City, which is making a run for promotion to the English Premier League, currently sits with 39 points fourth place tied with Southampton in the Football League Championship behind Birmingham City (46 pts), Derby County (43 pts) and Preston North End (41 pts). The trial was arranged between Konopka’s agent, Patrick McCabe of First Wave Sports Marketing of Natick, MA and David Jones, Manager of the Bluebirds and was facilitated by Paul Compton, Cardiff’s Director of Player Recruitment. The 6’5” 215 lb Konopka is expected to return stateside by Christmas Eve Dec 24. Throughout the 2006 college season, Major League Soccer coaches, FIFA Player Agents and European professional scouts were all seen on the sidelines during several of Konopka’s games. In addition to Cardiff City, Konopka’s abilities have also drawn recent interest in the past two weeks from Premiership side Aston Villa, Coventry City FC, also of the Championship League as well as several Scandinavian clubs with trial dates for all yet to be confirmed. This past summer Gerry Peyton, goalkeeper coach for the Premiership powerhouse Arsenal FC, reviewed some game tapes of Konopka and was encouraged about certain qualities he saw in the young American keeper. Konopka also had game tapes requested from Spanish Premiere League first division club Celta de Vigo, Manchester City of the EPL and two clubs from the FAI Irish Premiere League. Because of some direct ancestral ties, Konopka, who turned 21 years of age in April, is obtaining dual citizenship in Poland, a member of the European Union. Konopka was also recently named one of five goalkeepers invited to attend the 2007 Major League Soccer Player Combine from Jan 4 to Jan 8 in Ft. Lauderdale, Florida and will showcase his talents in front of the coaching staffs and general managers from all 13 MLS teams. During his Providence career, Konopka finished third all-time in most games ever played by a Friar goalkeeper. He allowed only 57 goals for a 1.17 career GAA, made 199 career saves and had a career save percentage of 77.7% over four years. The New Jersey native also re-wrote some of the Friar record books. 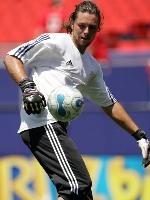 In 2006, Konopka garnered All-BIG EAST Second Team accolades becoming only second goalkeeper in Providence College history to receive All-Conference honors. Konopka also set a new Friar record in 2006 recording 7 BIG EAST regular season conference wins, the most ever in school history and led Providence to 13 overall victories, just one shy of the school’s all-time 14 win total set in 1984. The 2003 Toms River East High School graduate also became the first goalkeeper in Providence history to ever appear in consecutive NCAA Tournaments (2005 & 2006) and the only keeper in Friar history to lead Providence to 3 BIG EAST Championship Semi-Finals (2003, 2005, 2006). On the club side, Konopka made 14 appearances for the United States U19 Regional Team in domestic and international competition during 2003-2004 back-stopping the US team in France and Belgium against reserve teams from Ajax (Holland), Real Sociedad (Spain), Boavista Porto (Portugal), 1860 Munich (Germany), Osasuna (Spain) and Aalborg (Denmark) among others. A long-time Jersey Shore Boca Soccer Club veteran, Konopka was a member of Boca’s youth system, Super Y-League, U-20 and U-23 teams throughout his career as well as a member of Boca’s Premiere Development League (PDL) team in 2003. He also played for the New Jersey Falcons of the PDL during the 2004 season.